With her upcoming film Helicopter Eela’s promotional events happening in full swing, hardly a day goes by when we don’t see Kajol in a beautiful outfit. During these events, Kajol has been channelling her inner fashionista and not only is she nailing trend after trend but also setting some. From bold colours to prints to fusion – Kajol has worn it all and rocked it all, so much that we almost await her looks now. 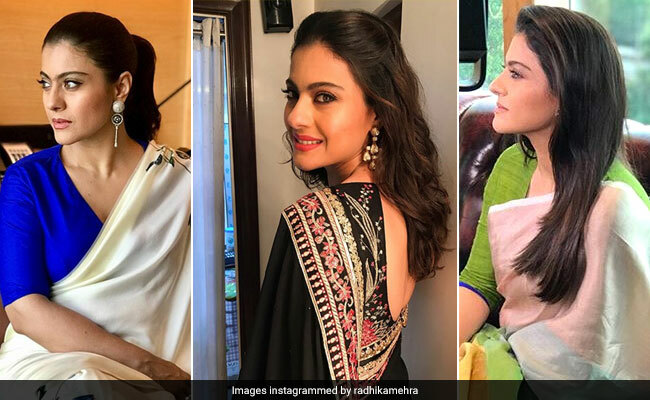 While we have been totally in awe of how Kajol has been carrying off the fusion trend, her sarees have also caught our eye. Raw Mango sarees are a thing of elegance and class. And a bespoke Raw Mango saree on Kajol was an absolute delight to see. Dressed for a promotional event in Lucknow, Kajol wore a beautiful white saree with floral motifs on it, paired with a royal blue blouse that clashed marvellously with the saree. The Lara Morakhia Vintage Silver dangling earrings with green glass & crystal polki added to the charm of the outfit. Another saree that Kajol wore that had us admiring her earthy taste is this Payal Khandwala piece. The colour-block contemporary saree with its bold colours and earthy texture was a win-win. Kajol carried off the look remarkably, with minimal makeup, open hair, and a pair of simple earrings. Kajol also wore this black Tarun Tahiliani saree with gara embroidery and floral motifs around the border and on the blouse. Although Kajol looked pretty, we are still a little biased towards the other two looks. Can’t wait to see the saree game on more often, Kajol!